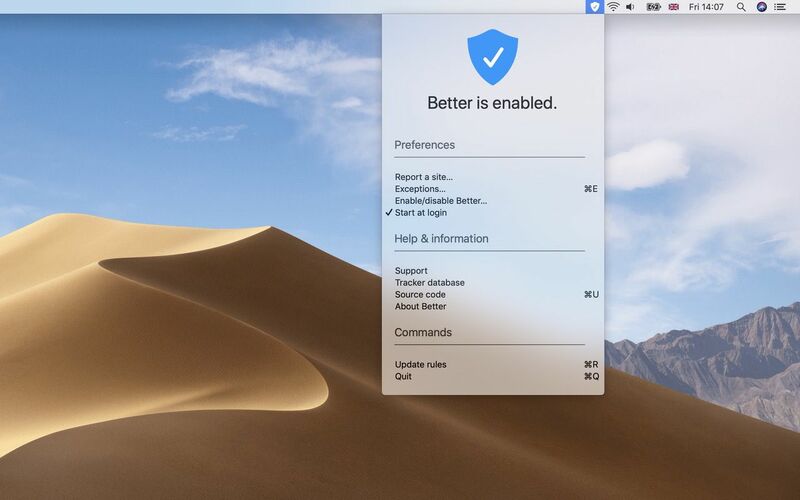 Better Blocker for macOS Mojave: simpler, more affordable, and just as effective. A little under a month ago, in Better Blocker: two-year review and thoughts on the future, I mentioned I wanted to radically simplify the Better Blocker iOS and macOS apps. I’m proud of what we’ve achieved with Better so far. However, I’m unhappy with the reach Better Blocker has and we must figure out a way of increasing that reach while not cutting off a source of revenue without which we could not afford to pay the rent. To that end, on September 17th, after several weeks of hard work and in tandem with the launch of iOS 12, we launched the redesigned Better Blocker iOS app (see Better, simpler, and more affordable). With the launch of the new version, we also dropped the price to the lowest tier on the App Store ($0.99/£0.99/€1.09/etc.) in line with our goal to get as many people as possible protected with Better while hopefully not destroying our ability to pay the rent in the process. 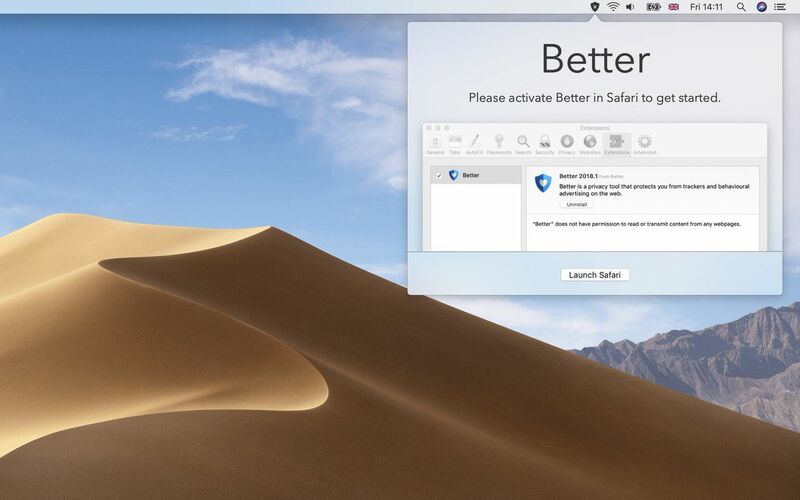 Today, we complete the roll out of the new design with the launch of the new Better Blocker for macOS. In line with the iOS app, we have also dropped the price to the lowest tier for the Mac app. Better Blocker is now a status bar app on macOS. Even though the new apps are radical redesigns, we decided not to release a new app. If you already bought Better Blocker for iOS and/or Better Blocker for macOS, you can simply upgrade to the new apps via the App Store. Again, this is because we want to see Better in as many hands as possible. So we’d appreciate it if you could spread the word and tell your friends who don’t have Better yet. The design of the macOS app mirrors the iOS app as much as possible. Given how much of the interface was removed in the process, it made sense to remove the main window altogether and make the app into a status bar app. 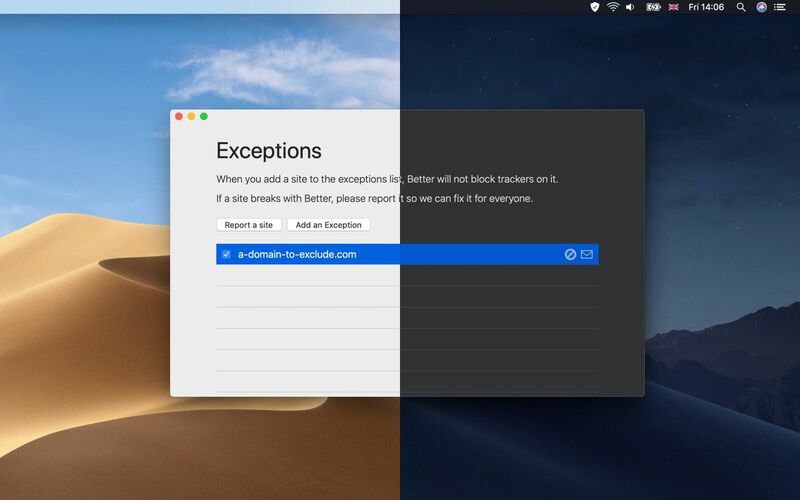 The only part of the app that has a window is now the Exceptions section, where you can specify sites that you don’t want Better to block trackers on. If you’re doing this because a site breaks Better, please use the Report a Site feature to let us know so we can fix it for everyone. 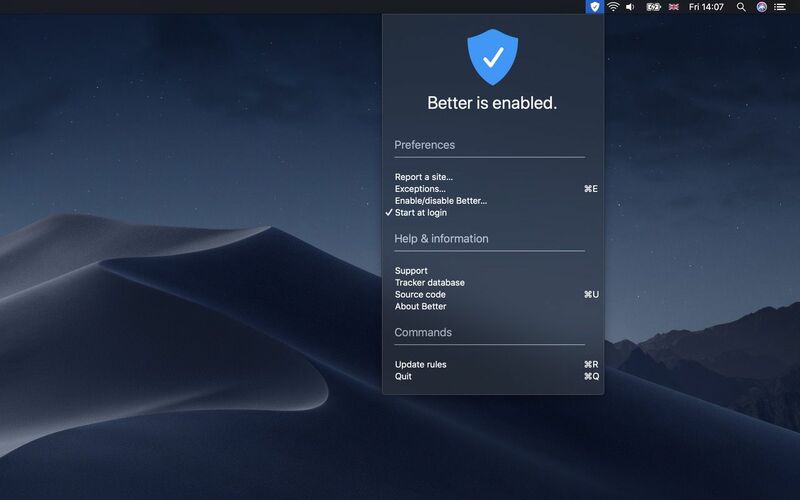 As part of the redesign, we also wanted to support the new Dark Mode in Mojave. Which, as you can see in the screenshot above, we did. I’m not a huge fan of Mojave’s Dark Mode (I find it too dark) but I have to admit that Better does look pretty cool in Dark Mode. Better does look pretty cool in Dark Mode on macOS Mojave. The 2018.1 releases of both apps are just the first step in a new direction. You can read more about where we intend to take them in my previous post. This week, we are working on the next minor release, 2018.2. If you want to support our work, please tell your friends about Better Blocker for iOS and Better Blocker for macOS. I hope you enjoy the new Better Blocker. I’m excited to see where the second chapter of our little independent adventure in making the Web a safer place takes us.